What is a good and affordable sewer camera? 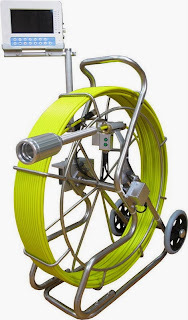 Can affordable sewer cameras also be good, delivering high quality images, navigating different types of pipes with ease, portable and offering multiple features for documenting, viewing and organizing inspection findings? Yes, it can. The time when sewer cameras were expensive, bulky machines is long gone. Modern designers and manufacturers are closely following the needs and demands of Remote Visual Inspections industry, trying to create versatile, highly mobile and efficient viewing devices that would not only deliver exceptional inspection footages, make the work of inspectors much safer, easier and more productive, but would also be inexpensive cutting down overall inspections costs. What can be more important than gaining profit and gaining more clients at the same time? CAIMAN Sewer Camera is one of those innovative devices offering a whole scope of advanced characteristics at an affordable price. The Camera is equipped with a high-resolution CCD self-leveling camera and 18 high-output LED lights integrated at the tip of a flexible fiberglass probe that can navigate pipes up to 120 meter long and can be easily traced underground due to built-in 512 Hz sonde. The self-leveling feature ensures that the camera keeps the upright position inside the pipe at all times, which is important if the probe has to travel long distance or pass multiple bends. The camera head is protected by an anti-scratch Sapphire lens, which guarantees high quality picture for a long time even if you have to use the camera in harsh or scratchy environments. Both, the probe and the camera head, are tightly sealed and are 1 Bar water-proof, allowing for different types of sewer and drain inspections with submersion. CAIMAN’s control unit is conveniently mounted on a light, compact wheeled reel that can house up to 120 meters of insertion probe. The control unit features a 7” digital monitor with 720 X 560 resolution. Snapshots (JPEG), video (AVI) and audio (MPEG4) recordings of the inspection can be replayed right on site, sent to a computer through a USB cable or saved to a micro SD card. Additional features include length counter, informing an operator of how much probe has been inserted, IR remote control, rechargeable Li-ion battery, 13.5V battery backup station with 10 hours working capacity. CAIMAN offers users exceptional sewer inspection experience at no extra cost or effort. 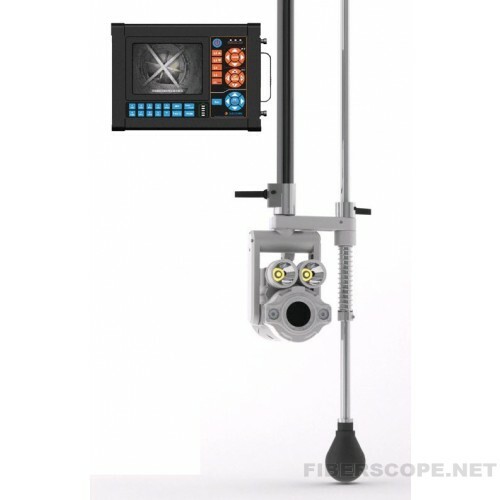 What is a good bore scope for day-to-day remote visual inspections? Whether you are a hired professional operating on the company’s budget, self-employed businessman trying to be smart about the money you invest in your company’s development or just a responsible home-owner searching for a particular bore scope, it’s always important to ask yourself several questions before purchasing a piece of equipment for remote visual inspections – How versatile is it? Will I be able to use it for different applications or just one type of inspections? Am I planning to use it on the regular basis once the project, requiring the use of this particular tool, is over? 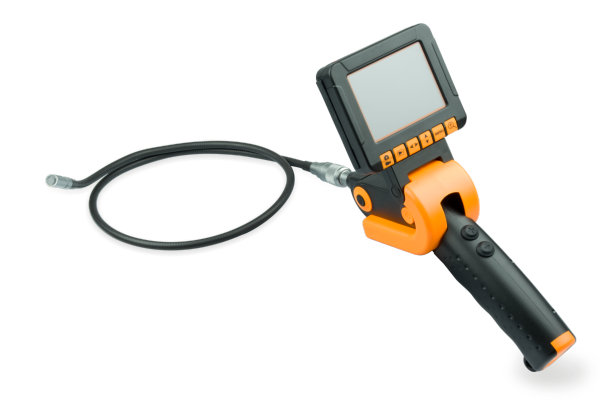 One of the latest versatile imaging devices that has been tremendously popular among our clients lately is a small, compact, hand-held JT-AlphaVideo Borescope. This starts to make sense as you look closely at the scope of features it provides. First of all, it is the highly intuitive single-handed operation it offers due to ergonomic, non-slip design and a joystick control and buttons conveniently located right under your fingertips. You can easily navigate the probe even through the tightest spaces, corners or bends as the probe’s short distal end articulates in four directions by means of the joystick control, and capture images by a single push of a button. And do all that with just one hand, which becomes especially handy if you have to work standing on a ladder or carry out inspections in extremely confined spaces. Secondly, the four-way tip articulation does not only make the probe extremely maneuverable and pushable, it contributes to high quality, detailed inspection images. 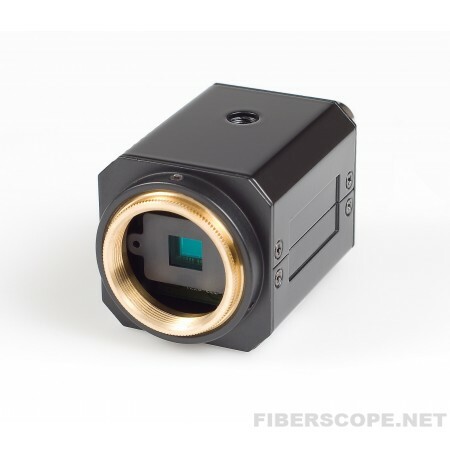 Take into account super intense LED lights illumination and a high-resolution (800x600) CMOS image sensor, and you receive a compact, highly maneuverable imaging device with exceptional viewing capabilities. The scope also features a durable, flexible stainless steel braided insertion probe (available in different lengths and diameters), 3.5” TFT LCD display and a USB slot to transfer images to a SD card. With all of that said, JT-Alfa definitely stands out from other videoscopes of its class as a highly portable, versatile viewing device that will greatly enhance your productivity and save you a great deal of money in the long run. While inspecting engines or other equipment there are a wide variety of situations when you might find it necessary to rely on a good inspection camera. Such inspection cameras can couple with different insertion probes, which are convenient in different cases. Finding the best probe for the specific task can be complicating and expensive. For example, a flexible probe allows observing hidden places which cannot be seen directly. Articulated flexible videoscope can shoot a good video inside closed boxes or hollows. 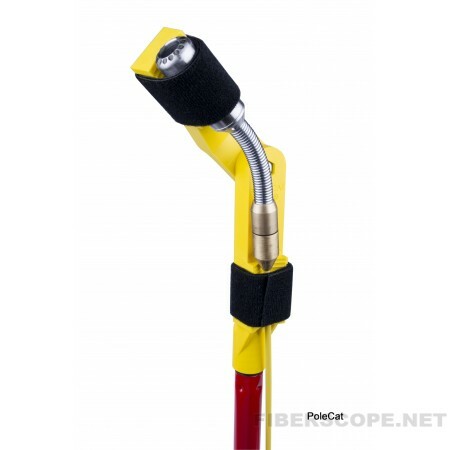 Long flexible probes are significant for inspection of tubes or pipes. But sometimes rigid borescopes are more convenient, because they give a better image at a lower cost compared to a flexible fiberscopes. The image is exceptionally clear. When an object is located within direct access, rigid borescopes are the best. However disadvantages of rigid borescopes include their fragility. Different tasks require a number of inspection tools: flexible borescopes with various length and diameter, rigid borescopes, video cameras and light sources. Purchasing them separately can be costly and unprofitable. A universal system would be the best way out. The new inspection camera system ED-Cam from MEDIT is a universal, portable inspection device, which can be coupled with a lot of rigid and flexible probes. Simply change the videoprobes for your specific task. This inspection system includes a portable recording hub with a high-resolution color 7" LCD display and a CCD camera with 1.3 Mp resolution. 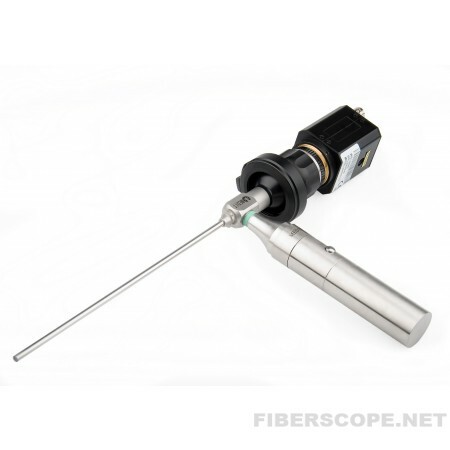 The universal focusable video coupler can be attached to any 32 mm optical (either rigid or flexible) borescope eyepiece. Included IR remote control offers inspection operability. The unit can record still images and video with voice recording to SD memory card or to laptop via USB cable. The display allows to observe every detail. 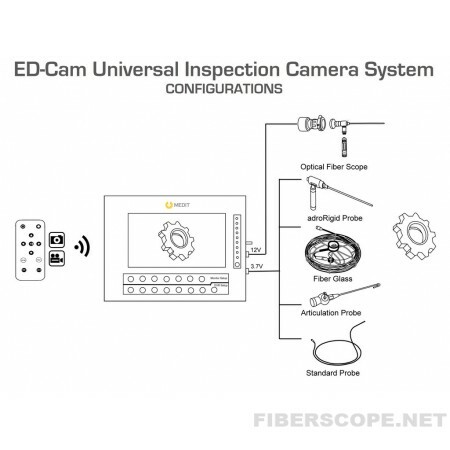 It is possible to locate the ED-Cam Inspection Camera System to any inspection site even without electricity supply, it can be powered from both rechargeable battery up to 4 hours, or an external power supply. You can see some variants of installation in the pictures. More details about MEDIT inspection cameras can be found here. Because sewer lines are located underground, the problems with them are often hard to detect until they come in the open, as let’s say a sewage back-up. Sewer lines may be flat, offset, root-infested, or even broken, which can end-up in reoccurring sewer clogs or back-ups, leading to property damage, loss of operating time for businesses and costly repairs. However, sewer camera inspection can spare you from this nerve-racking experience. This new non-destructive testing (NDT) approach allows both contractors and their clients to save time and money on excavation jobs while getting a full picture of the problem area. Having a sewer line inspection before buying a property will allow you to negotiate on the price and even ask for a discount in case there are sewer line problems. Sewer camera inspections are important regardless of the age of the home, as there may be hidden problems that you won’t be able to detect just by running water in the bathroom sink. There are several ways to inspect a pipeline remotely depending on the nature of the problem. NDT specialists can run a snake in the pipeline through a manhole in the street, or check the condition of your pipes right in your bathroom or kitchen. Usually sewer cameras consist of an insertion probe with a camera integrated into its tip. There are different lengths and diameters of probes, and various types of cameras for specific applications. You can watch the whole process on the display. Sewer camera inspections are also important as a preventative measure, before pipeline relining, or when cleaning a pool. They can not only detect clogs in the pipelines, but inform you of the condition of the pipeline and what kind of material was used to construct it, thus allowing you to make an educated decision on future repairs and plan the budget. 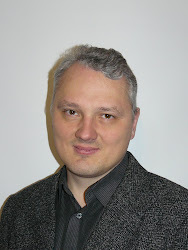 It is vitaly important to examine sanitary infrastructure before buying a property or making investments, and before building new estate objects. Water stains - sign that the sewer line is not draining properly. Physical damages - cracked walls or floors suggest movement of the foundation. Outside “cleanouts” - outside cleanout that is not original to the home is a possible sign that repair was performed recently. Trees - near the area of the yard where the sewer line runs should always be cause for concern, because their routes can break old pipelines. Hidden damages of pipeline - can be detected only during video inspection with the help of special cameras. 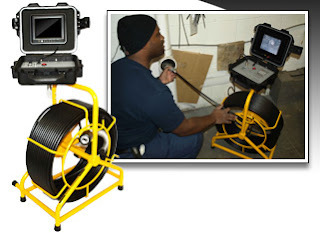 A new CYCLOPS Manhole Inspection Camera can be used for inspection in sewer, water, and waste mainlines, ducts and pipes. This unit has a telescopic rod for easy single-user operation and ideal for pipes with diameter from 200 mm (8’’) to 2.000 mm (78’’). This Inspection camera is equipped with a new generation of LED lights that automatically illuminate the inspection area at zoom in. CYCLOPS manhole camera has a powerful zoom (36×optical and 12×digital) with a detection distance up to 80 meters. The camera body tilts automatically up 45° and down 90°. Inspections can be recorded by either image (MPEG) or video (MPEG4/AVI) capture and saved onto a 4Gb SD memory card. The imaging hub is equipped with a 5.7’’ TFT color monitor with 640x480 pixel resolution. 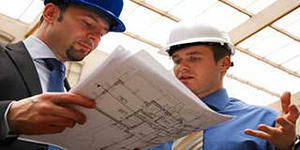 There are many industrial areas which require careful inspection. Gas Safety Regulations demand regular inspection of gas cylinders for defects. Many techniques are used to achieve this. Often visual inspection by borescope or video borescope is applied. The insertion probe of videoscope is inserted into empty cylinder and the operator can observe the inner surface. A new videoscope is offered to perform such inspections. JT Alpha bore scope offers 4-way articulation and easy navigation and control by joystick. High resolution screen depicts nice image. Steel braiding protects the probe from scratches. Powerful LED light source provides a good illumination. JT Alpha video bore scope is an efficient tool that makes the work of video inspections cost-effective, comfortable, fast and highly productive. 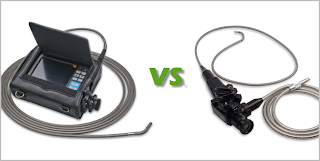 Why are rigid borescopes better? Some specialists are interested in rigid borescopes and they want to know their pros and cons. 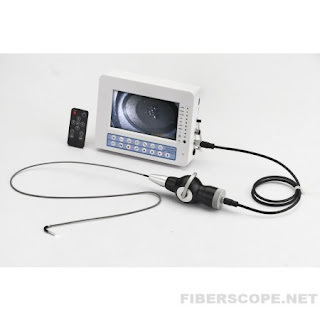 A rigid optical borescope (can be seen here) is an optical device with a rigid metal tube and eyepiece on one end and an objective lens on the other. Between them we can find a complex relay optical system. Optical systems in them can be of three main types: Hopkins rod lenses, achromatic doublets and gradient rod lenses. For large diameter the achromatic doublet relays are good, but as the diameter tube gets smaller the rod lenses provide better images. For very small rigid borescopes, the gradient index lens relays are better. The tube contains also glass fibers for illumination. The illumination can be provided either by LED light source attached as a handle to the light post of the borescope, or by external powerful Metal Halide, Xenon or Halogen light source. In this case the light is transferred via flexible glass fiber guide. alideAn internal image of the object is formed by the objective lens and magnified by the eyepiece, which presents it to the eye. What are advantages of rigid borescopes? 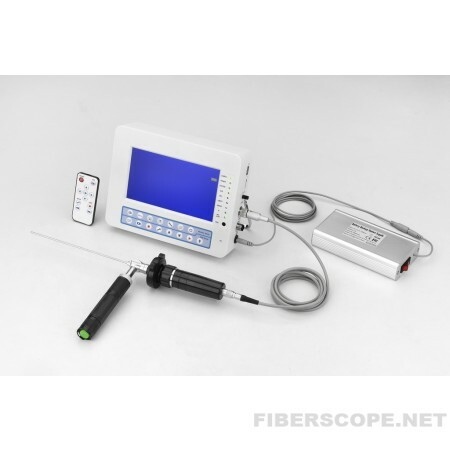 They provide a superior image at a lower cost compared to a flexible fiberscopes. The image is exceptionally clear. When an object is located within direct access, rigid borescopes work well. They are recommended for gunsmithing, automobile inspection like observation of automotive cylinders, injectors and hydraulic bodies. It is possible to attach a video camera to the eyepiece, and after that the inspector can record video and still images for further processing. What then are disadvantages of rigid borescopes? Rigid borescopes are limited to access to a straight line. It is impossible to view hidden objects behind something. Besides they are fragile instruments and don’t like falling down. Watch the sewer pipe inspection camera Viper-S out of the box. Here is the source of the similar to VIPER-S affordable sewer push cameras. The application of smartphones now goes far beyond their main usage as phones. You can see an interesting device - borescope adapter for iPhone, which transforms the smartphone into a kind of videoscope with rigid probe. 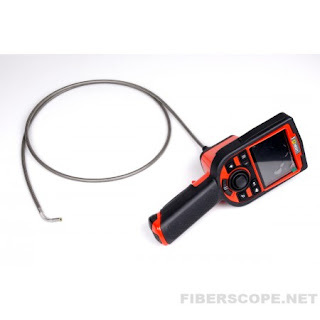 To see a new borescope that can be used with IPhone, IPad or Android devices - please visit this page. 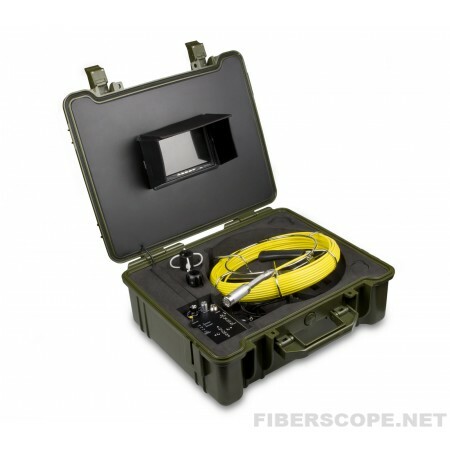 A new USB video borescope opens new frontiers in borescope inspection. 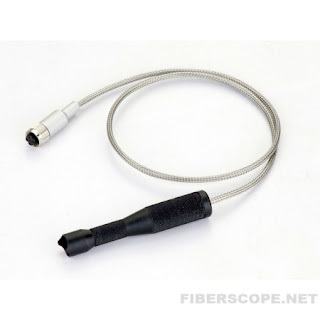 With this borescope USB handle it is possible to connect a wide variety of probes to any laptop, desktop or tablet and make it a perfect tool for inspection. Many probes are available: rigid, rigid with articulation, flexible and flexible with articulation and length from 1 meter to 30 meters. Please watch the following video introducing this outstanding videoscope. You can find more information here. How to Use an Inspection Camera? Today borescope testing gains more and more popularity. But some technicians doubt if they have enough skills to work with an inspection camera. However working with it does not require special knowledge or skills. There are some simple rules to follow. First of all it is necessary to determine the correct length and diameter of insertion probe. Then you have to think about what is better to use – rigid or flexible probe. If you need to document your inspection, you would need an inspection camera, which has a special monitor hub with recording ability. 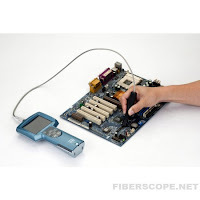 With the help of an optical borescope you will perform a visual inspection through a device eyepiece. Insert the probe with caution through the inlet and switch on the light source. You will immediately see the desired area. In case of an inspection camera turn the power on to activate the device and the light source, and insert the probe. If light intensity is too strong, you can gradually decrease it. Press on recording button and your video will be recorded in AVI or other format onto an SD card. Remember that borescope probes are rather fragile; therefore it is better to avoid excessive bending or forcing. Here is an example of using an inspection camera to inspect a car engine. When a car has an interference engine, if the timing belt failed, it is quite possible that the pistons hit valves before the engine stopped completely. 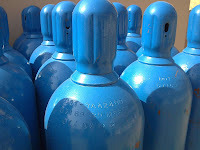 After a compression test, if the valves are bent they will not seal properly, and the compression readings will be low. Then you can take a scope and inspect through the spark plug holes and look for impressions on the piston tops. Inspection cameras with 2 meter long probes and tip articulation are the most convenient for this kind of inspection. The flexible probe will show the damage that may have occurred without disassembling the top part of the engine. What is the difference between rigid and fully flexible articulated videoscopes? Where is it better to use rigid probe and where - flexible? These and some other questions are answered in the following video. This video is about rigid videoscope Heron and flexible videoscope Rigel. You can see details here. Inspection CCTV cameras become very popular for inspection of chimney surfaces. They are convenient for small diameter chimney, old stone flues in unknown condition to get safety certificates, etc. Chimney and fireplace systems need video inspections as much as other ducts or canals in the buildings. A new and cost effective solution for inspection of ducts, chimneys and fireplaces is offered. Contractors, who seek the best solution for their needs, can choose Viper push camera with PoleCat. Viper push camera has a semi-rigid probe with length 20, 35 or 40 meters, powerful light source and sensitive video camera with sapphire glass lens. The PoleCat allows using a long pole to support the camera. And it is a very important feature: generally chimney inspection cameras have a soft cable to use only from the roof level downwards. However Viper push camera with the PoleCat can be used from both levels: roof and ground, upwards. Besides it is possible to fix the camera at various angles for better view. Viper pushcamera with PoleCat is the best solution due to its easy design and very reasonable price, considerably cheaper than common chimney inspection camera in the market. Besides this set provides versatile usage for every, even complicated construction of air duct, chimney or fireplace. See the sample of video and images taken by CCD Sony camera attached to rigid borescope. EXview HAD CCD is a trademark of Sony Corporation. EXview HAD CCD is a CCD Camera sensor, which drastically improves the light efficiency by including near infrared light region as a basic structure of HAD (Hole-Accumulation Diode) sensor. The set of a rigid borescope and high-resolution SONY CCD camera can be largely used in many areas including car service, airplane turbines and checking welding seams. Inspection becomes very efficient due to high resolution of image and wide depth of view from 5 mm to infinity. Rigid borescopes are computer-designed and comply with standards. 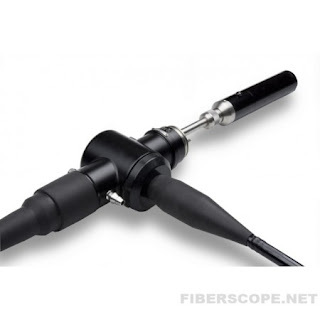 The body of the borescope, light post and insertion tube are made of stainless steel. All exterior elements are well adjusted and fluid resistant. The coated rod lenses, in the optical system, provide brilliant image quality with great contrast and brightness. The construction of the optical system guarantees a distortion-free image of the inspection area. You can find more information here about rigid borescopes and video camera.